If you stopped by to read last week’s blog, you know that I posted that entry a couple days earlier than usual. Like many of you, I traveled to be with my family for Thanksgiving, which is always a very special event in our lives as Americans. It was a great joy to be able to be with my family in Florida this year. On Thanksgiving morning, we celebrated Mass for the family at the local parish, St. Richard’s. Afterwards, about 50 of us gathered at my cousin’s house — the Mulligans — for Thanksgiving dinner. Of course, we had turkey with all the trimmings, and many, many pies! It certainly was a splendid evening and a wonderful chance to see everybody at once. 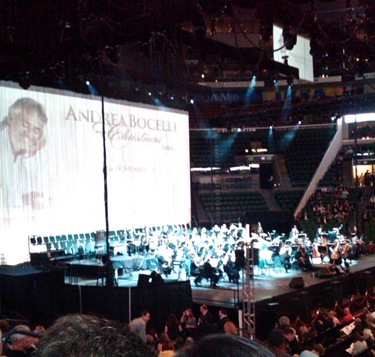 The following day, they took me to a magnificent concert in Fort Lauderdale given by Andrea Bocelli. He was accompanied by an orchestra from Miami and sang with a choir and a couple of other vocalists during the show, which was in two parts. The first part was classical music and the second part was a Christmas selection. 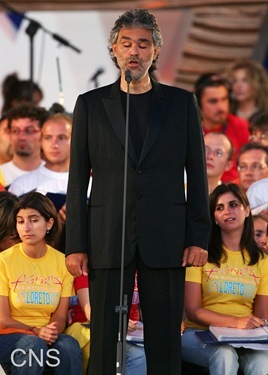 What a powerful and beautiful voice Andrea Bocelli has! The audience wouldn’t let him go — he came back and gave four encores. I understand that he began his singing career in the parish choir, and he is a devout Catholic. It was a great joy to be able to see him personally and to hear him. By Sunday, I was back in Boston for a celebration of the Feast of St. Andrew with our Greek Orthodox brothers and sisters. 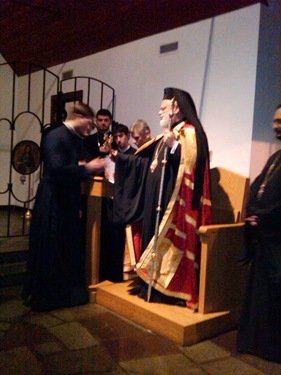 Each year, we have an exchange of delegations on the Patronal Feast of each Church, which mimics what the Holy Father and the Ecumenical Patriarch of Constantinople do. This year, Cardinal Kasper was in Constantinople representing the Holy Father on the feast of St. Andrew; then, for the Feast of St. Peter, either the Ecumenical Patriarch or his representative will be in Rome. 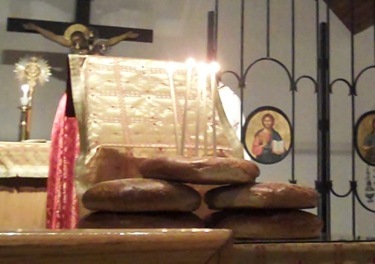 Here, on the Feast of St. Peter, Metropolitan Methodios always comes to one of our churches. 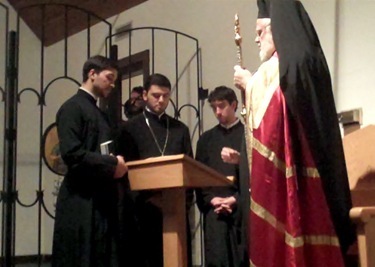 This year, on the eve of the Feast of St. Andrew, we went for vespers at the headquarters of the Greek Orthodox Metropolis. We were able to be with Father Edward O’Flaherty, Father David Michael, and Dr. Vito Nicastro, of the archdiocese’s Office for Ecumenical and Interreligious Affairs, who were also representing us. 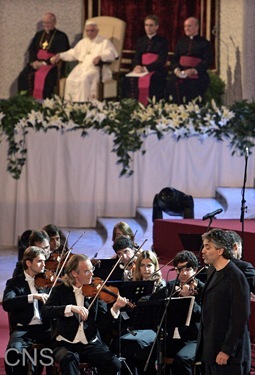 There was also Professor Vives, who has taught in the Greek Orthodox seminary for many, many years. Their vespers services are very moving. They are much like ours, but with longer readings and litanies. They also sing the Kyrie Eleison many, many times, which reminds me of the days when that prayer was always part of our Mass. On Monday, I hosted a meeting with members of our Catholic Schools Office and the presidents of the Catholic colleges in the archdiocese. As I have mentioned in other posts, we have been meeting periodically on how we can coordinate the efforts to strengthen Catholic elementary and secondary schools in the archdiocese. The following day, I met with the superiors of local religious communities at the Pastoral Center to discuss the apostolic visitation. My intention of bringing them together was, first of all, to assure the sisters that the Church is very grateful for all of the wonderful work of our religious women. They have a glorious history in the United States that has been essential to establishing Catholic education, Catholic health care, and so many other ministries. Of course, I was also anxious to hear their reaction as to how the visitation was going. I encouraged them to participate in and cooperate with the visitations and assured them that the sister in charge of the visitations, Mother Mary Clare Millea, is an extraordinary religious woman who will try to be extremely helpful to the sisters. During our meeting, I shared with them some of my experiences as an apostolic visitator to seminaries. There was a certain nervousness about the seminary visitation at the beginning, but it turned out to be very positive and ultimately strengthened our seminaries. In this case as well, the desired outcome is a study that will help us to strengthen religious life in the United States. There has been such a decline in numbers in the last several decades that, of course, the Holy See is deeply concerned. I assured the sisters that our participation in the visitation is something that will be good for the Church in America and that we should not hesitate to cooperate. 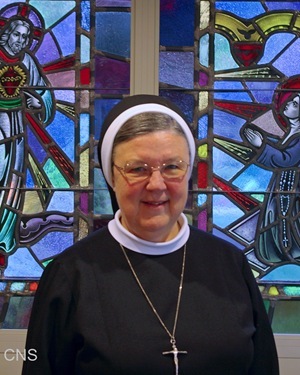 For their part, some of the sisters shared with me that the instrument itself was difficult to complete, and I will certainly share that with Sister Clare. However, overall, I think it was a very good meeting and that the sisters had a chance to express their opinions and ask questions. Hopefully, we all left with a greater appreciation of the implications of this visitation. 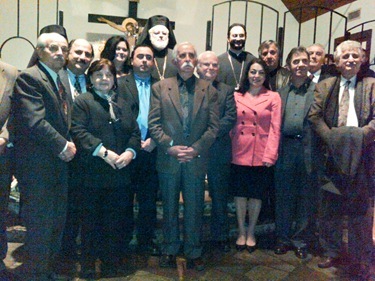 On Monday evening, I attended a gathering of recently ordained priests at St. John the Baptist Parish in Quincy. Several times a year I gather with the priests who have been ordained within the last five years for a Holy Hour followed by a meal and conversation about priestly life. I have always done this in the different dioceses where I have been bishop. 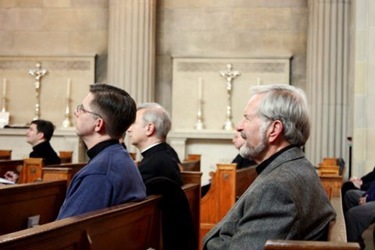 These types of gatherings are very important because, statistically, it has been demonstrated that those first five years are difficult for priests. They must learn a new identity and sometimes there have been priests who have abandoned the ministry during this period. 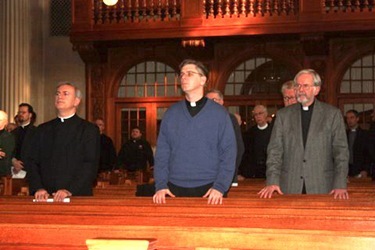 These kinds of programs, which support them and bring them together with their bishop, are very valuable and I am very pleased that in Boston we have not lost one young priest. This month, our Director of Vocations, Father Dan Hennessey, joined us as we discussed how priests can be involved in vocation promotion, particularly during this Year for Priests. 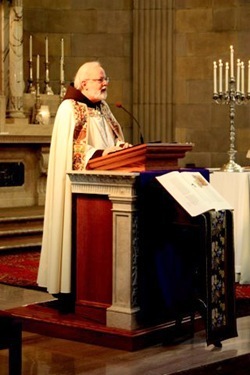 All of the studies indicate that one of the most important factors in discernment is when a priest suggests to a young man that he consider the possibility of a vocation. I think some priests don’t realize the impact that can have. It was a very good exchange. It is always wonderful to have the time with our newly ordained priests. On Wednesday, I attended the Day of Sanctification for priests held at the Campion Center in Weston. 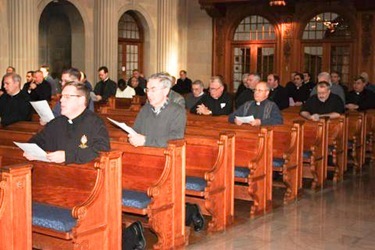 This day of recollection and sanctification for priests was one of the activities in the Year for Priests. The auxiliary bishops periodically organize days of recollection. This one, though, was organized by Father Bill Kelly and the Office of Clergy Support and Ongoing Formation. 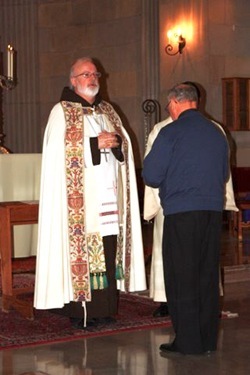 There were two conferences focusing on the priesthood — one given by Father Peter Grover, an Oblate of the Virgin Mary, and another given by me. 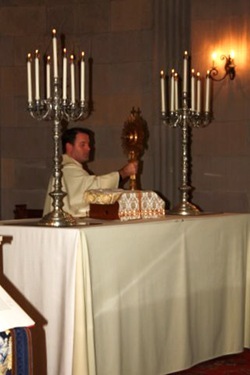 We had adoration and confessions during the course of the day. In all, there was a very fine response with a cross-section of about 50 priests participating. It is always good when we can gather as a presbyterate, particularly in this Year for Priests. Now that the Thanksgiving holiday is behind us, the Church enters into the new Liturgical Year with the season of Advent, in which we are called to prepare for the birth of our Lord Jesus. Please be assured of my prayers for you during this Advent season!